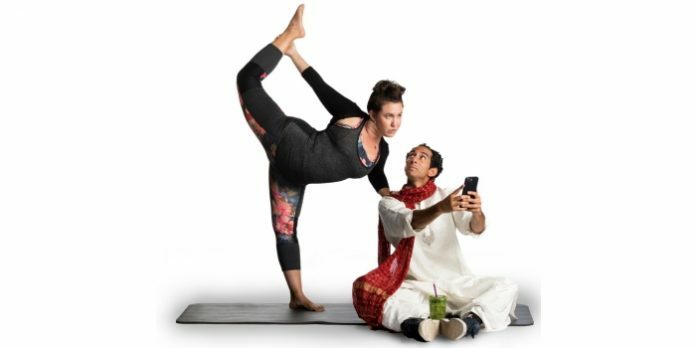 Christine Quintana and Chirag Naik in the Canadian premiere of Dipika Guha's Yoga Play at Richmond's Gateway Theatre. Photo by David Cooper. Vancouver’s obsession with yoga is as legendary as our passion for its clothing. In Dipika Guha’s new comedy, Yoga Play, the business of this ancient meditative practice gets turned upside down in a comedy that asks what it takes to find authenticity in a world determined to sell enlightenment. In a story that many Vancouverites might find eerily familiar, Yoga Play is set inside the fictional yoga apparel giant, Jojomon. When a scandal sends them into free fall, the newly hired CEO stakes everything on a wild plan to recover their earnings and their reputation. In his final show at Richmond’s Gateway Theatre, outgoing artistic director Jovanni Sy will direct a cast featuring Lois Anderson, Hrundi V. Bakshi, Derek Chan, Shawn Macdonald, Chirag Naik, and Christine Quintana. Helping the director to bring this Canadian premiere to local audiences is stage manager, Susan Miyagishima. While pretty much part of every show, for many in the audience the role of stage manager is an unfamiliar one. Just what is a stage manager and what do they do? We find out in this Q&A. A stage manager wears many hats, can you tell us what a stage manager does? In broad strokes, the stage manager oversees all operations of a performance. It’s my responsibility to make sure the actors are where they need to be, they have all the necessary props and costumes for their scenes, the sound and lights and video and any other scenic or technical element happens at the right moment, and overall, that everyone stays safe throughout the show. During rehearsals, the stage manager also acts as a hub of sorts, making sure all the information about how the show is shaping up in rehearsals gets transmitted to the design, technical, and administrative departments so that everyone is able to do their jobs to support the show. 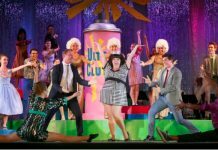 What has been the most fun in stage managing Yoga Play? Yoga Play is really a very smart and funny play and we are constantly laughing in the rehearsing hall. The cast is truly stellar and what they are bringing to these characters and the story is so much fun. There is rarely a scene where the team at the stage manager or director’s table aren’t laughing out loud. In your career as a stage manager there must have been an emergency or unexpected glitch that you had to mitigate. Give us the story and the fix. Oh so many. Failed technology, power outages, costume malfunctions, stuck set pieces, on-stage injuries. Since theatre is certainly a “team sport”, my favourite moments are when the team pulls together and the collective creativity, and a bit of adrenaline, keep the show on course. There was the time we lost power in a one-man storytelling show, and he asked the audience to pull out their cell phone lights as he continued with his story. There was the time on a touring show, we misplaced one actor’s costume, so we all pieced together a suitable replacement with bits and pieces from other people’s costumes and our own personal clothes we were wearing that day. I ended up calling the show in socks because the actor was wearing my shoes. There was the time a large set piece got stuck in the middle of the stage, so we had to perform the entire last quarter of the show with a giant house unit in the middle of every scene and the actors adjusted all their blocking and choreography on the fly to make it work. Those are some of the more major occurrences, but with live theatre, almost every night brings something unexpected. When you get a stage management gig, what kind of show gives you pause? And what kind of show makes you eager? Every show has its challenges and joys. The variety is one of the things I like best about being a freelance stage manager. I can’t say there’s one particular type of show that I like more than others or that I’m hesitant about more than others. Sometimes big shows are beasts that are super stressful, but also some big shows are the most fun to do. Sometimes small intimate shows or innovated off-the-beaten-path type shows are very rewarding and really feed my creative soul, but sometimes they are a hot mess. And it’s rarely the show itself that brings me to a gig. It’s the people, the team I get to work with and play with that makes me excited to jump on board. And then we all do our best to make sure it’s positive experience. Yoga Play opens at Richmond’s Gateway Theatre on February 7 and continues through February 16. Visit gatwaytheatre.com for tickets and information.